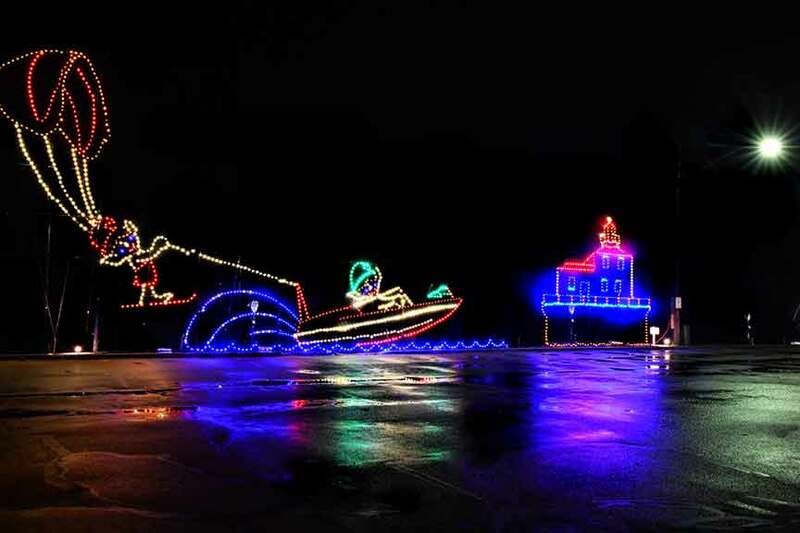 ASHTABULA TOWNSHIP - The Lights on the Lake holiday-lighting display began on Friday, Nov. 23. Experience over 70 displays on Lakeshore Park’s 54 acres of rolling hills and majestic Lake Erie backdrop. The holiday light attraction, with some displays as “big as a truck,” is great for creating memories and family fun. The display runs from Friday, Saturday and Sunday, Nov. 23 - Dec. 30, 6-9 p.m. There are holiday hours on Dec. 24, and Dec. 25 from 6-8 p.m. According to Chair Rick Coblitz, this season will mark their 13th year offering the bright light display in the county and will be the third year they have offered it with bright LED technology. This year’s lights are scheduled to include displays such as Santa, elves, dragons, big trucks, swans and an Ashtabula Harbor lift bridge replica, among other displays. Some changes this year include the “Arches” and flood lighting. Guests will see more displays and a variety of added effects that lend extra sparkle and glitter to the park. And it’s all for a fee of $5 a carload and $20 for a mini bus at the gate. There is also the option to purchase tickets in advance at local merchants, which includes a deal that if you buy five tickets, you get a sixth for free, along with the chance to win $500. Anyone planning on attending this year’s event can also view the display while listening to Christmas music supplied by WGOJ, 105.5 FM within their car as well. In the past, Colblitz said that people have attended the event as a family tradition and that many come more than once. Another annual tradition, he said, also includes times in which people pay for the vehicle behind them, all while supporting a good cause as a portion of the season’s proceeds will go to a 501c3 nonprofit corporation. Last year’s profits were donated to the Beatitude House, Homesafe and to the United Way Reading Program. For people who want a closer look at the lights at their leisure, Lights on the Lake will also be offering its annual walk-through as well for $1 a person on Thursday, Nov. 29, weather permitting. The lighthouse with a boat decorates the water front.